To see and experience Murcia’s cathedral is a true feast for the eyes and senses. Its exterior is a vision of Baroque and Renaissance styles, with a bell tower that literally towers 95 meters over the city. The soaring structure houses 25 bells, each with their own name, and which have, in times past, together served to warn of various events from floods to wars and celebrations. Built starting in 1394 on the site of a former mosque, the church is a mish-mash of styles given that its growth continued until the 18th century. Its Gothic interior is no less impressive than the exterior, featuring 23 different chapels — the most notable of them is Los Velez with its magnificent, star-shaped vaulted ceiling. The cathedral is also home to a museum, where you can discover a range of religious artifacts, as well as spy the excavated remains of the former mosque. The cathedral is centrally located in Murcia’s old town. Take advantage of your visit here by grabbing a bite to eat at one of the square’s outdoor restaurant terraces as you enjoy views of the church’s flamboyant façade. Note that Murcia is a short trip away from the neighboring coastal city of Cartagena, making both easy and rewarding stops while in the region. Hours: Monday to Sunday from 10:00 a.m. to 1 p.m., and 5 p.m. to 8 p.m. Discover the best of Murcia and take in top city attractions with ease on this private full-day tour from Cartagena. 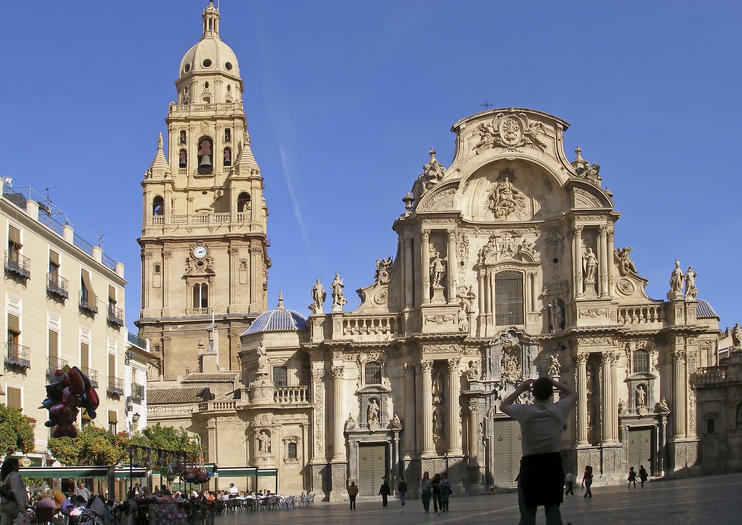 Follow a private guide through Murcia’s historic streets and admire famous landmarks including the Cathedral Church of Saint Mary in Murcia, the 19th-century Real Casino de Murcia and the Romeo Theater. Along the way, marvel at historic Roman archaeology at the Punic wall of Cartagena, soak up the atmosphere along the bustling Calle Mayor and admire fine sea views from the pier at Cartagena. Get to know the rich history and culture of Murcia on a private walking tour just for you and your group. Stroll through the old city center with a professional guide, exploring the city's most charming quarters and learning about its past. Visit the Gothic-Baroque Murcia Cathedral, built in the 15th century, and the glamorous Real Casino de Murcia. Enjoyed personalized attention from you guide and ask all the questions you like. Get to know the charming city of Murcia and the surrounding region during this private excursion. Learn about Murcia’s lemon industry during a visit to a local plantation then explore Murcia city highlights like the historic cathedral and Real Casino de Murcia, and talk a walk through the city streets.